Operation Billionaire is a rousing success with one woman married and another engaged. Now, it’s high-powered professional Rosalind’s turn at catching her billionaire. But Rosalind hasn’t set her sights on love. She has less romantic goals. Heading to Bora Bora for a business meeting with her billionaire boss, she’s bound and determined to get him to put a ring on it. But her plans are dashed when her plane crashes onto a desert island. Now, she’s alone with the irritating guy from Seat 2A, who she wouldn’t marry if he was the last man on earth. But now he sort of is the last man on earth… Can these enemies become lovers? Can Rosalind find her happily ever after? 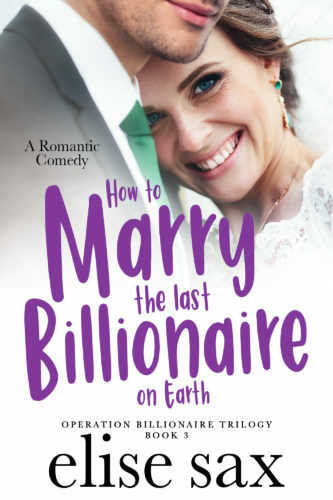 How to Marry the Last Billionaire on Earth is the third book in the hot and hilarious new trilogy by the author of the Matchmaker books.